Some of you may be aware that I have been taking a closer looks at the applications that are installed by default in the KDE version of openSUSE. It is time to move on to the multimedia applications and first up is Amarok. 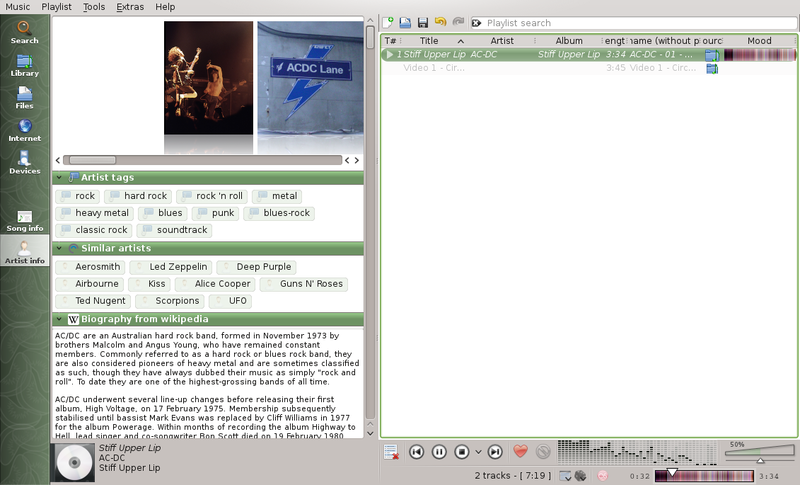 In the past I wasn’t really a KDE fan but I always considered Amarok to be a decent audio player. 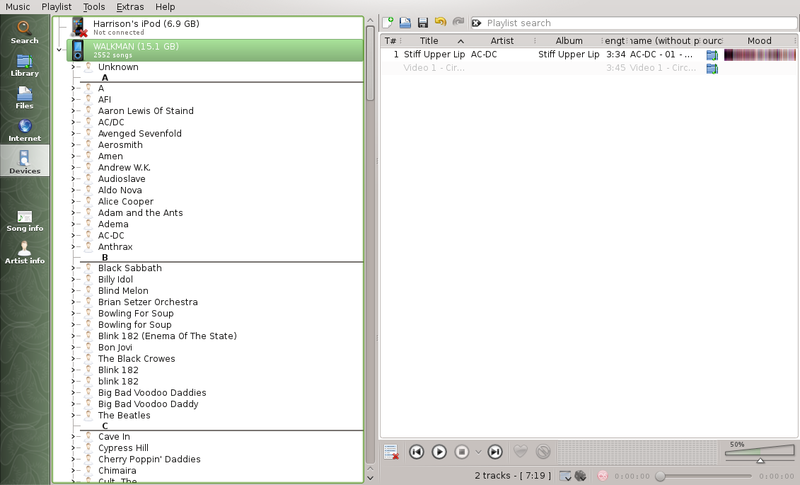 Now I have become a KDE convert I have discovered that Amarok isn’t as good as some of the other audio players out there. To help show what I mean I have installed Clementine and I will show a comparison of the two during the article. There is a default look and feel to Amarok but you can change it to look the way you want it to by dragging the panels around. In the screenshot above you will see that I have a panel with the recently played tracks, a dummy playlist in the centre and a list of media sources on the right hand side. 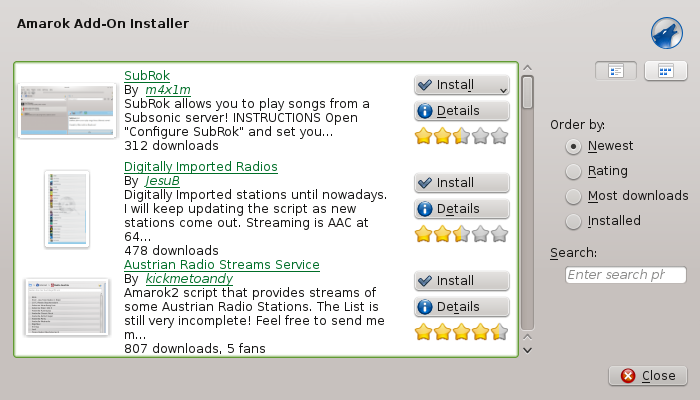 The are a number of plugins that can be added to Amarok and the openSUSE version has some useful ones applied by default. 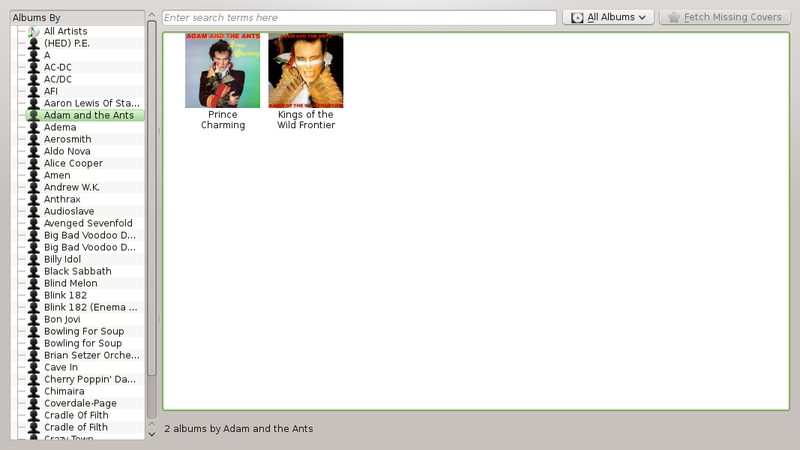 For instance there is a Wikipedia plugin which tells you all about the artist and song that is currently playing. If you are anything like me then you will struggle with the lyrics to songs. For years I thought Bon Jovi were singing about “Barry Venison”. I wondered why an American rock band wrote a song about the former Liverpool centre back, and only a supreme deity knows what the words to Rock the Casbah are. (Actually Amarok knows them as well). On the right hand side of my screen (although it can be anywhere you choose to put it) is a list of sources and depending on which source you choose you get a different view. For instance if I choose to look at my local music collection I can select to search the collection by Genre. I can switch the view at any time though and filter by Album, Artist, Year or a mixture of all the above and more. There are other online sources to choose from. For instance you can choose online services such as Jamendo, Amazon, Last.fm and Cool Streams. Not all of the options worked for me and in some cases you have to download data. 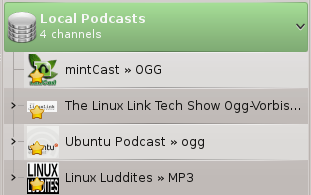 I was impressed by the Podcast directory. The UK coverage is excellent and includes all the BBC podcasts. If you have podcasts that you listen to regularly then you can add them in to Amarok. All you need is the RSS or Atom feel URL. 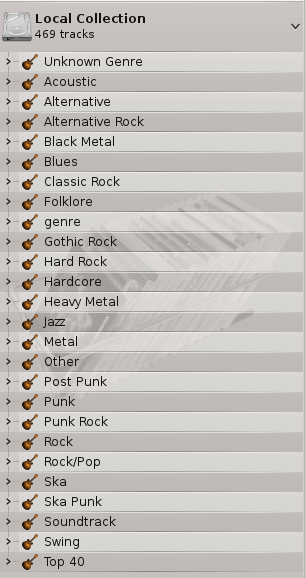 There are various ways to play music within Amarok including setting up folders which are used to build up your local collection. For a quick start though you can choose the “Play Media” option on the Amarok menu. As mentioned before you can adjust the layout of Amarok but when you have it the way you like it you can lock the user interface. If things are just getting too messy and you want to get back to the initial settings there is a reset option. No music player would be complete if it didn’t contain the ability to create playlists. Adding songs to a playlist is as simple as right clicking on them and selecting “Add to playlist”. You can of course remove songs from a playlist, clear the entire list and export the playlist. When you click on an an artist the artwork for each of their albums is shown. How that artwork is downloaded is up to you. You can change the settings to automatically download artwork or you can open the cover art manager and import missing artwork yourself. Amarok can be configured in many different ways via the settings -> configure Amarok menu option. 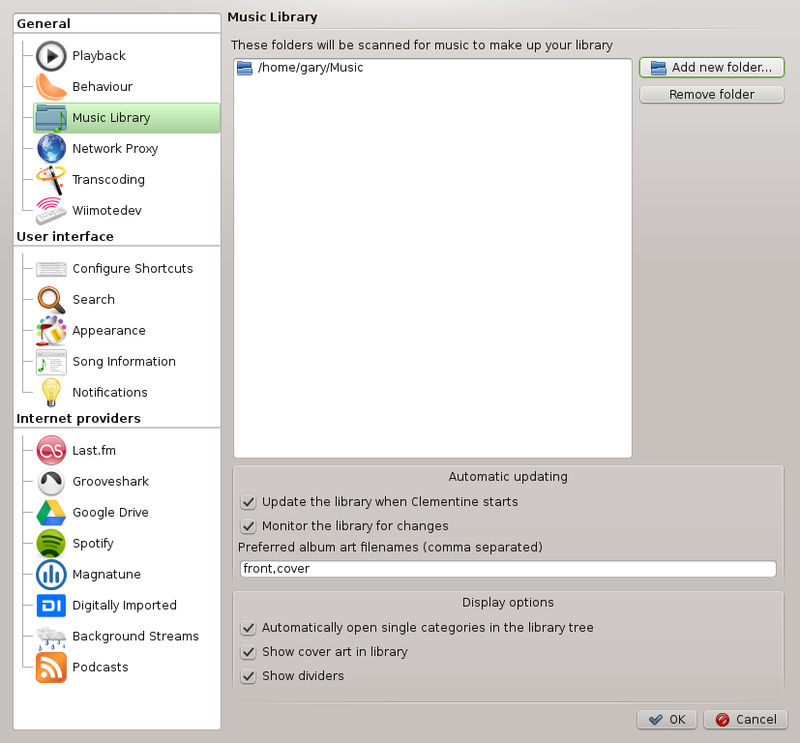 As with most KDE applications there are dozens of different options. One of the key elements of Amarok is where the music is imported from as part of your local collection. 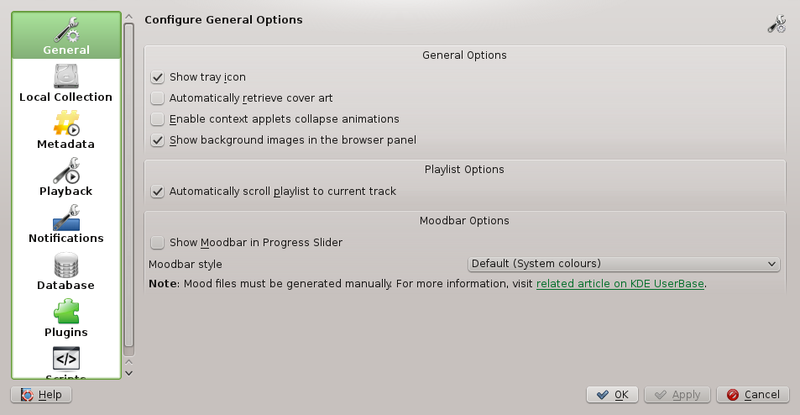 The “Local Collection” tab within the Amarok configuration settings lets you choose which folders store your music files. 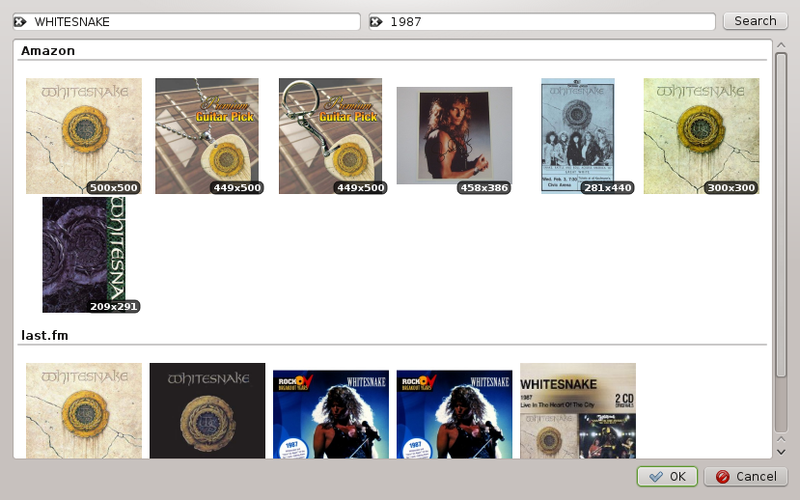 The “Full Rescan” option searches the selected folders for any new tracks. The import option lets you import tracks from other applications such as iTunes (I haven’t tried this option). As mentioned earlier there are a number of plugins that are installed with Amarok and these provide functionality such as integrating iPods, MTP audio devices and Universal Mass Storage Collection devices. In theory your MP3 player should be covered by one of these plugins. 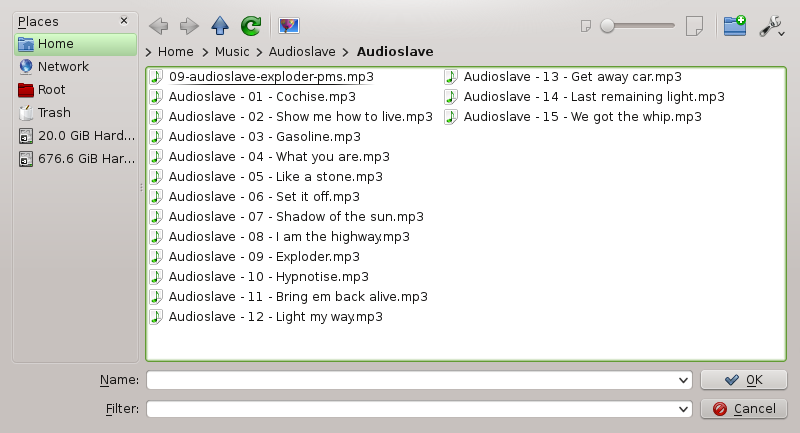 There are a number of other add-ins that can be installed and this is why Wikipedia and Lyrics work by default in Amarok. To be honest iPod support within Linux is hit and miss and this has much more to do with Apple than any of the Linux based audio players. I have searched for these errors online and there are various links for Kubuntu, openSUSE, Mageia and PCLinuxOS which all basically state that certain newer models of iPod just don’t work. 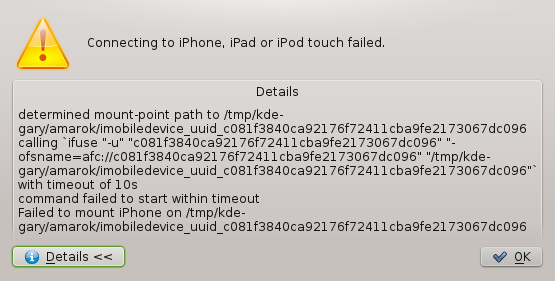 If you happen to have an iPod Touch then all is not lost as Clementine recognises the iPod without any errors at all. Clementine can be installed via your package manager. Whilst Clementine can recognise the iPod and play songs from it, actual integration is still hit and miss and you have no real access to iTunes. Some sources suggest using iTunes via WINE but others state that the performance is horrible. Hold on though. Amarok doesn’t like that either. An openSUSE issue or a general Amarok issue? From reading up online most people seem to state that they manage their devices using Dolphin (the file manager). As you can see though Clementine provides instant access to the Walkman. 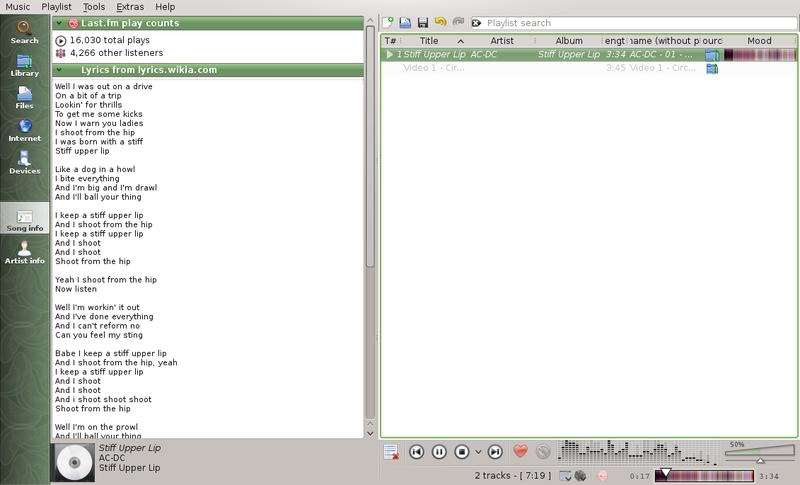 Personally I think Clementine is the better audio player of the two. The user interface is clean, it is easier to use and has all the functionality of Amarok. To add music to your library click the left pane. Upon clicking the empty library pane you will be taken to the Clementine settings where you can define playback settings, set your folders, adjust your user interface and choose the online music providers. To add your music folders click the “Add new folder” button. You can now find and select the folders you wish to add. 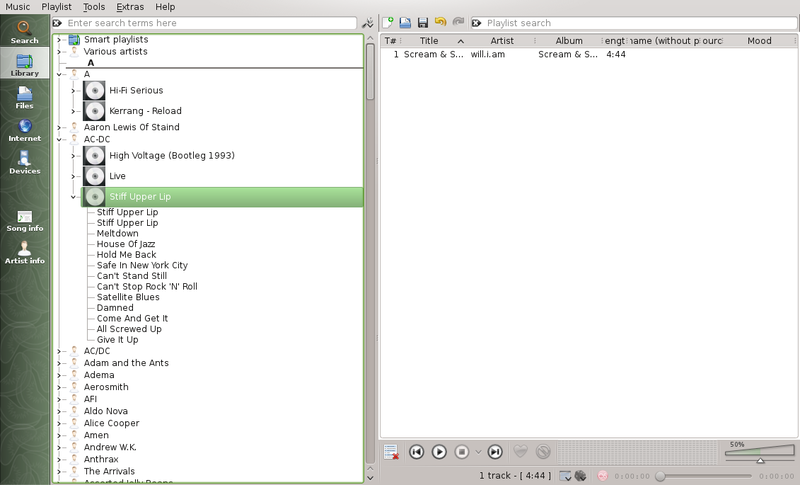 Once you have music imported into Clementine you will see a list of artists and albums. This view can be changed so that it is filtered differently such as by Genre. There are a number of online services available such as icecast, jamendo, grooveshark etc. You can also add your own podcasts. 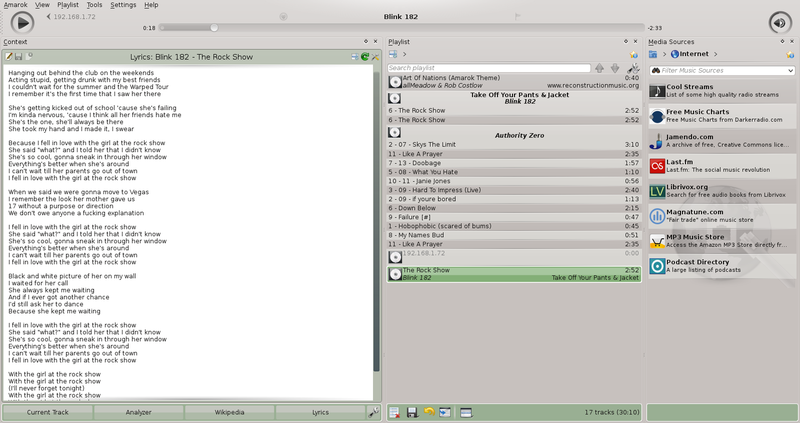 As with Amarok it is easy enough to create and manage playlists. 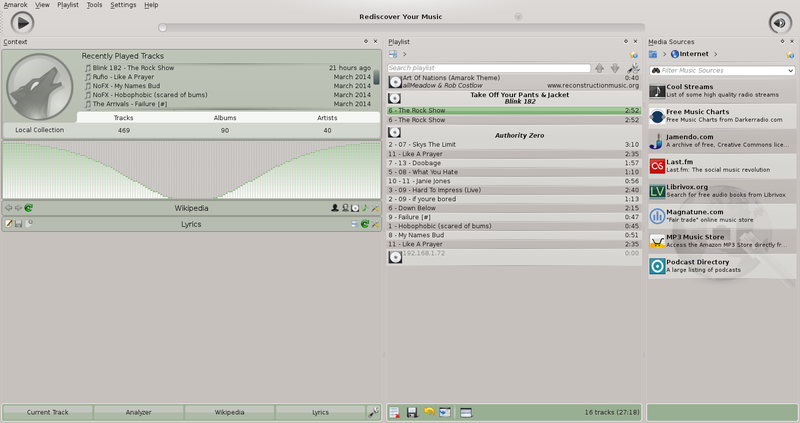 In fact I would say it is easier to manage playlists within Clementine. Clementine includes a song info feature which gives you the all important lyrics. (If only that was around when I was younger, it would have been a lot easier to learn Ice Ice Baby). 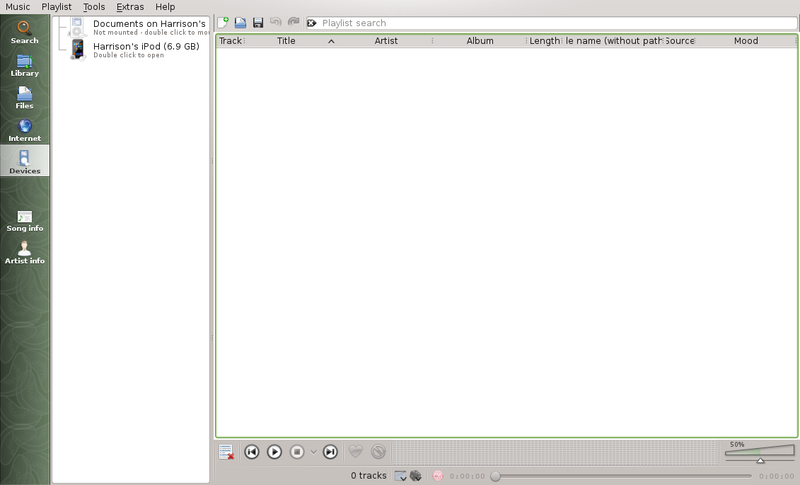 The Artist Info option provides information about the artist for the track that is playing. If you like to have the cover art for your music collection there is a cover art manager similar to the one used by Amarok and you an either choose your own artwork or search online. Amarok is the default application installed with openSUSE but I would certainly recommend using Clementine instead. Clementine feels lighter, has a nicer interface, the online options work better and there is better support for external audio devices. Have to agree. I love Clementine and it is the only music player I use. +1 I like clementine better. And there is nice android app Clementine Remote for it as well. Yup, I used to like Amarok, but I am on MX-14 now, and clementine came with it. At first I was skeptical and was using VLC (also light and fast). But I tried clementine, and now prefer it. It is stable, and stays out of my way. Clementine is what Amarok used to be before changing over to the KDE 4 toolchain. I used to love amarok, but it has been is unstable for years… Clementine got much better, doesnt crash and seams to do all that I need. Good job! I use Clementine for it's multi-platform and Portableapps option while at work, and Madsonic Server (a free Subsonic Server fork) for phones and Android, because my phones won't hold 500 GB (42,000 songs) of music. I discovered Clementine awhile back and greatly prefer it over Amarok. It's never crashed on me. Much better, easier to use, cleaner interface and pretty much ready to go. I install Clementine on all of my linux boxes, including those with Gnome. By far my favorite audio player. Clementine, totally! It streams HBR1.com flawlessly. Amarok does not. amarok. there has never been a better music player on any platform. clementine is based on amarok anyway so there you go. amarok! prefer Amarok to Clementine but to be honest I used XMMS the most. I like a minimalist mp3 player that DOES NOT take up my whole screen ALL THE TIME. Seriously…How hard is it to make a full screen version and a lite display version which leaves just a small display which gives a few basic info (name song ,volume,pause,next, time playing-left)? 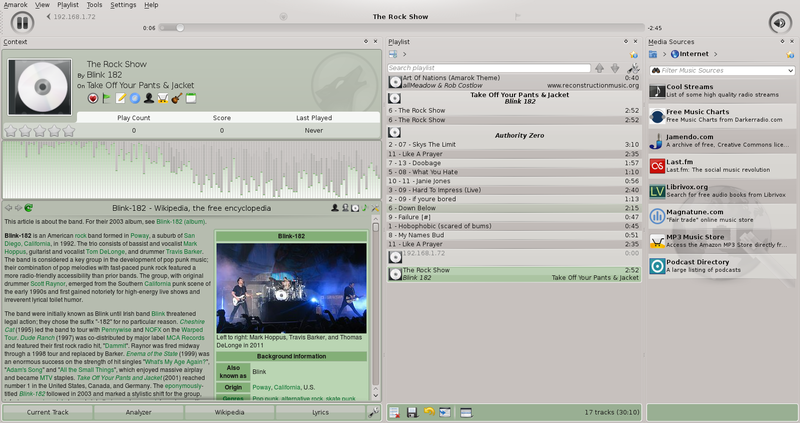 I've not used amarok on linux (I tried it on windows, but found it inferior to MusicBee), though my favorite player for linux is clementine. 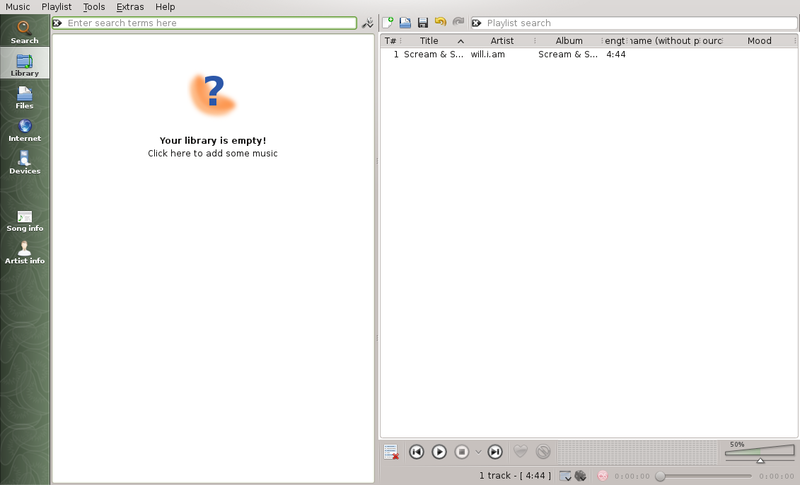 But I've not found anything in free software that's as good as MusicBee. Informative article, thanks! 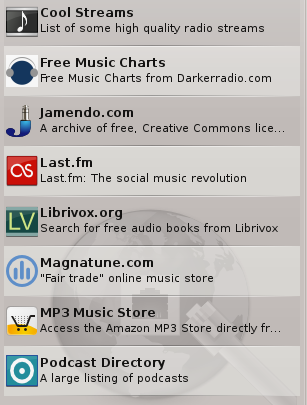 Have been battling with Rhythmbox for the last week after buying a new computer and installing Ubuntu 14.04. It worked better on earlier distros but this version keeps trying to contact Last.fm when all I want to do is play my own collection. Will check out Amarok again and Clementine. I just want something that plays while I work and stays out of my way until I need it. In 2015, I think that Amarok got better. Although I used to love Clementine, at the moment it has numerous problems such as crashes and distorted renderings when playing some files. I don't understand why that happens. 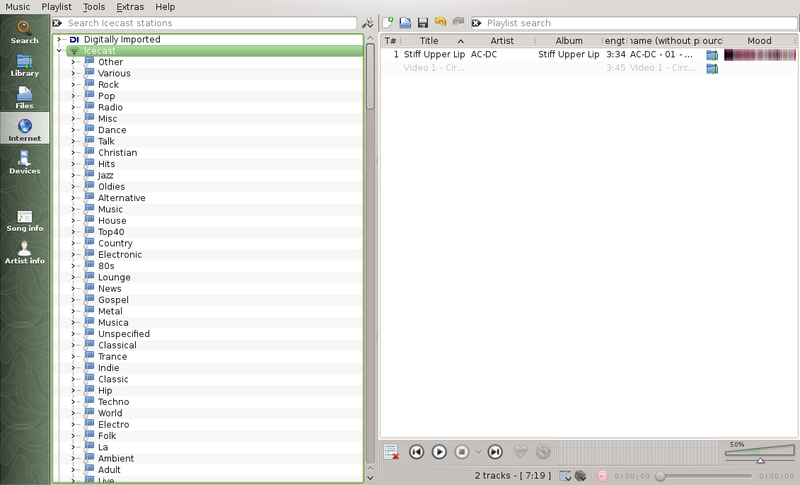 I thought at the beginning it has problem with flac, but the same song in mp3 format has the same distortions. Until I find the cause I need to go back to Amarok, which does not have the same issues when playing those files. Since v2.8 Amarok seems to gone back its 1.0 roots.